I’m visiting my mother this week, to help her clean out her garage and open some boxes she still hasn’t unpacked from her recent move. These are some things that I found in my mother’s kitchen that she’s probably had since the “big depression/recession”. You know, that one that started in 1929 and lasted until the early forties. This cake house mold is one of my favorites. However, I’m guessing that this one is from 1957 since it says 1957 on the roof of the January house. The packaging gives you examples of cake houses for each month of the year. Birthday cakes, wedding cakes, and there’s even pictures for making a “ranch house” and barn with straw made from shredded coconut. My mother said I could have this, so the next person I know that has a birthday is getting a house cake! This bowl came from a deli/meat market that my grandfather owned in the forties. It was provided by Tuttle’s to sell their cottage cheese. I remember my mother using it as a mixing bowl. I remember eating a lot of Jello treats that were made from these aluminum molds. I can’t believe that she still has this box of Betty Brite cupcake papers, although I don’t remember my mother making cupcakes very often...maybe that’s why. She did make custard, in these cups. I loved it, still warm from the oven. These may have belonged to my grandmother. 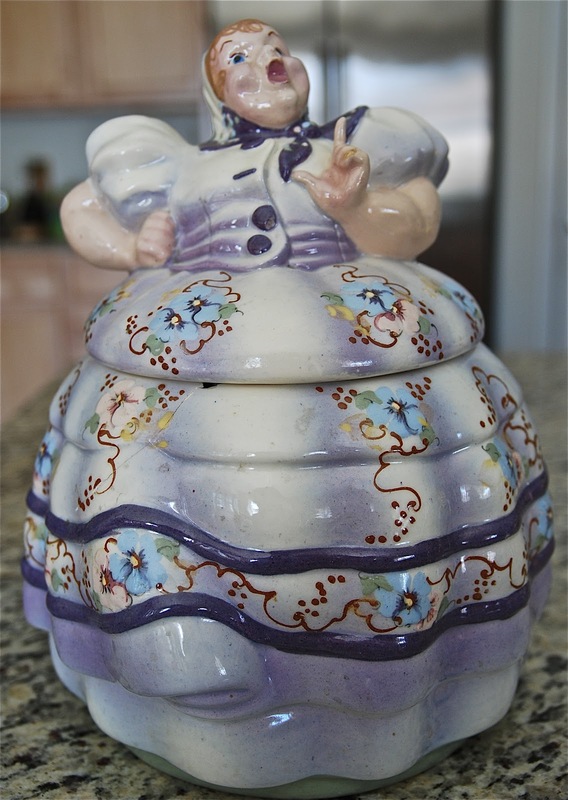 This cookie jar was always one of my mother’s favorite things. It used to call out “mama” when you turned the top upside down. The idea was that when the kids raided the cookie jar, it would call the mother to let her know. I don’t remember my mother keeping cookies in this jar, I think she was afraid we would break it, but it always had a place on the kitchen counter.